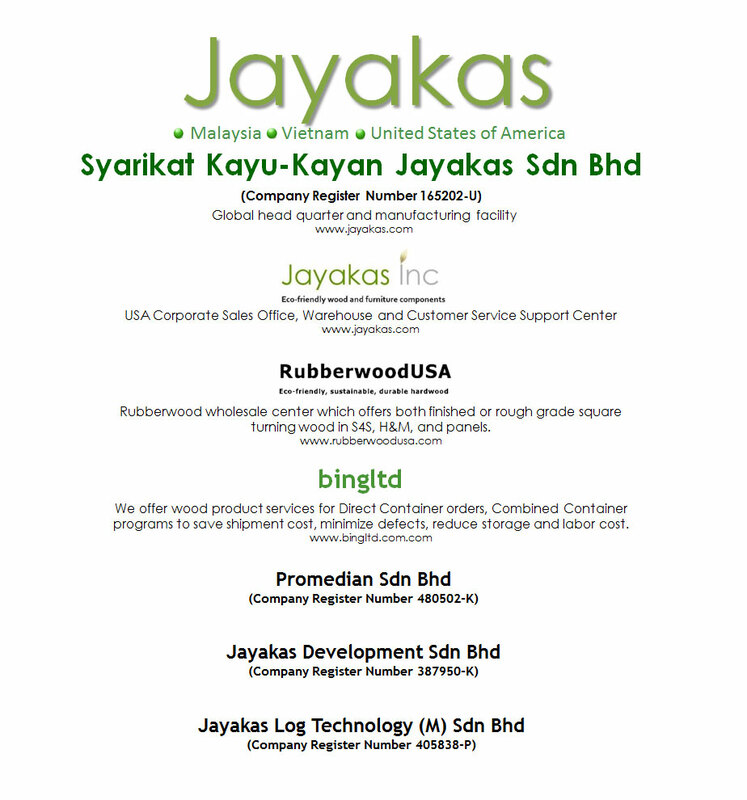 Established in 1987, Syarikat Kayu-Kayan Jayakas Sdn Bhd (Jayakas) is a Malaysian integrated wood manufacturing company. We own and operate a 52,300 sq metre industrial facility with a workforce of 180 employees at Sungai Petani in Kedah, one of the northern states of Peninsular Malaysia. Our primary business activity is the contract manufacturing of quality turnery furniture components for clients from all over the world. In line with the expectations of our international clientbase, our in-house manufacturing processes are subject to stringent quality control at every stage. At Jayakas, we are also committed towards fulfilling the requirements of the Malaysian Timber Industry Board. Today, thanks to the dynamic leadership of Cheng Joo Chooi, our managing director, the Jayakas name is now known worldwide. Our quality-oriented and cost-competitive products, including those showcased in this portfolio, are marketed in Europe, East Asia and the USA. We are continuing on our mission to become a leading producer of wood products of superior quality and innovative design; and we aim to market our products more widely through strategic alliances and networks. To become a leading and benchmarking manufacturer of quality, reliable and eco-friendly rubberwood products that eventually becomes a global recognised brand. To provide high quality eco-rubberwood products that combine performance with value pricing, while establishing a successful relationship with our customers. 20 years ago when very few companies in the timber industry were thinking about global warming, Jayakas has already invested a large amount of resources and time in research and development of Rubberwood – the eco-friendly timber. Jayakas factory has pioneered the process of direct extraction from Rubberwood. From that year until today, we have developed the shortened process time and optimizing the usage of materials, which translate into time and cost savings. In Jayakas we strive to create quality products that balance the market demand and sustainability of the environment. We work in ways that value humanity and the environment now and in the future.